The Trump presidency has experienced but one significant legislative success in a year: the tax reform bill. In other words, Pelosi and her entire party, without a single exception, have characterized the tax bill as an unjust obscenity. I present a modest proposal on how Democrats can ‘stick to to Trump’ and his entire gang of greedy, self-centered Republicans. It is so ridiculously easy: ignore the law. That will show Trump how much they despise him. 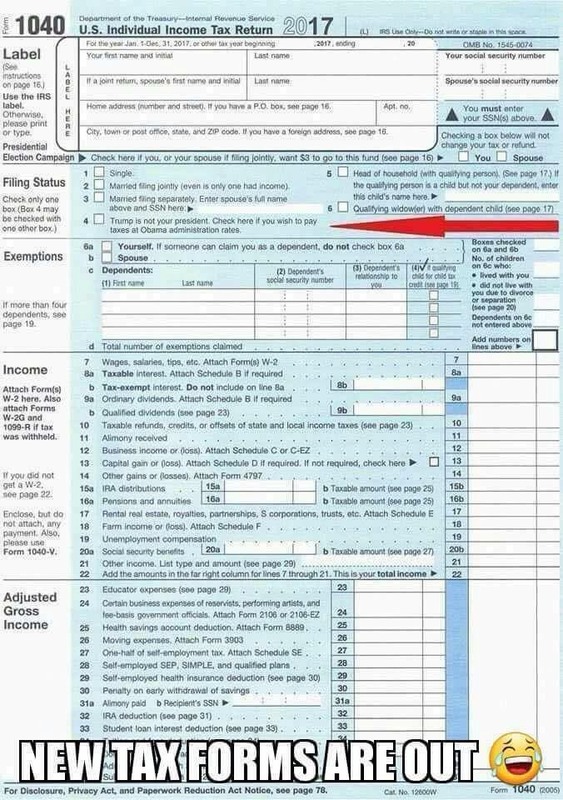 Even more, they should insist that Trump’s IRS print a special tax form for “the Resistance” to simplify the efforts of Democrats and Trump-haters everywhere to pay the higher Obama tax rates in effect before the insidious Mr. Trump signed this corrupt piece of legislation. I’ve provided a sample below on how this form could look. If you are a Trump-hating, tax loving liberal reading this blogpost, line 4 is for you. Go ahead, stick it to Trump. Sure it’ll cost you thousands of dollars, but it is so much cheaper than paying it to your shrink to work out your anger issues. I think my dog’s a Democrat! Is the smoking gun the smoking gun? Also check if you want to lose your job to an undocumented alien.